Ok, I think it’s time you and I had a little chat. Yes it is absolutely as serious as it sounds and no, you haven’t done anything wrong (or have you??). What I want to talk to you about is tempering. I mention this technique in many of my Indian recipes and you may be wondering……What is this tempering she speaks of? Well, wonder no more my munchkins! Tempering is not a synonym for ‘flying into a rage’, not that I ever claimed to be above that. Nor does it have anything to do with chocolate, at least in this instance (although I agree that would be infinitely more fun). What I am referring to is the snap! crackle! pop! 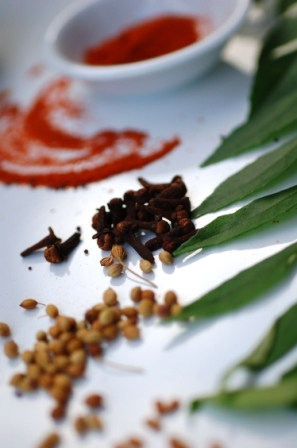 of Indian cooking, the tempering of spices. There is something about hot oil or ghee that makes spices more fragrant, flavoursome and generally sexier. And it really doesn’t take a lot of oil. I normally use a couple of teaspoons when I’m cooking for two, but feel free to use more, especially if unlike me you are blessed with a tiny waist and a lightning metabolism. Any cooking fat can be used but IMHO canola, sunflower or vegetable oil, or ghee tend to complement Indian flavours. The general rule, as I understand it, is to temper in the beginning for curries, and at the end for soup-like dishes such as dhal, rasam and sambar. So for curries, I temper in the main pan, then begin adding the rest of the ingredients. For dhal and such, I temper the spices in a separate little pan to add to the dish at the end. 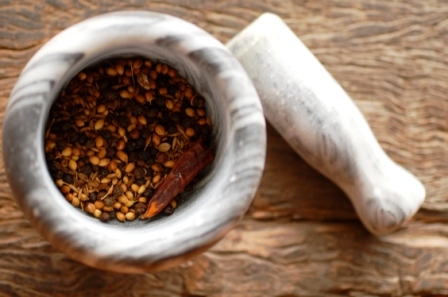 I commonly temper things like mustard seeds, cumin seeds, curry leaves, dry red chillies, finely grated ginger and garlic, cloves, bay leaves and powdered spices. 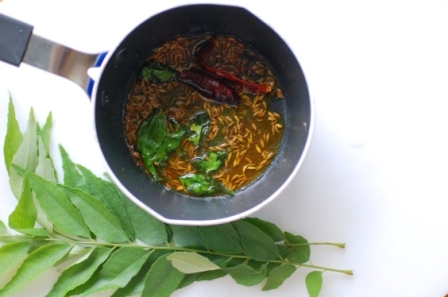 I heat the oil first, then add the seeds, followed by other dry ingredients and finally, fresh curry leaves. I don’t tend to temper fresh herbs (apart from curry leaves), and prefer to add them to the dish towards the end of the cooking process instead. When it comes to mustard and cumin seeds, it’s important to make sure they all pop in the oil and I’ll tell you a little secret- this bit terrifies me! I have been known to take a deep breath, unceremoniously dump the seeds into the steaming oil, then scrunch my eyes closed and jump back to the other side of the kitchen to avoid being burnt by the mini fireworks display on the stove. Then someone pointed out that holding a lid over the pan is a much more elegant way to avoid injury. Smarty-pants. If you are not sure whether the oil is hot enough (look for a slight shimmer), the perfectly acceptable cheat’s way is to drop in a couple of mustard or cumin seeds to see if poppage occurs. Always maintain control of the oil temperature- I often turn the heat down or even off once the seeds have popped to prevent burning things. Tempering requires your undivided attention, so it is not to be juggled with distractions such as that last season of Gossip Girl. No, not even that gorgeous episode with the masquerade ball. 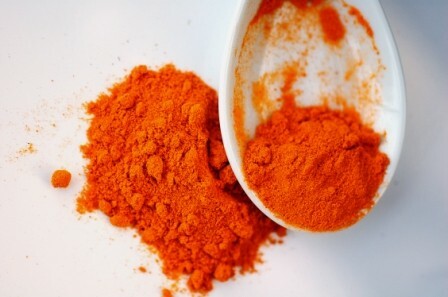 An annoying but unavoidable truth of tempering is that if you burn the spices, you must get rid of them (safely), wipe the pan clean, breathe deeply and start again because trust me, as tiny as those suckers are, burnt seeds are perfectly capable of ruining the whole dish. Once you have tempered to your heart’s content and start adding other ingredients such as onions, vegetables, meat etc., remember that the oil and the pan will cool down with every ingredient added so you can then start to increase the heat. So that’s pretty much it, boys and girls. The art and importance of tempering. Have I forgotten anything? I welcome your input in the comments box below! Man, I have burned so many spices while attempting to temper. My mom keeps telling me it’s a crucial part of a recipe but these days, I just tend to skip it. Your post inspired me to give this whole tempering thing another go! I can so relate- I’m a good one for wandering off to do something else and coming back to find a charred mess! Definately give it another go, I think it makes such a difference. 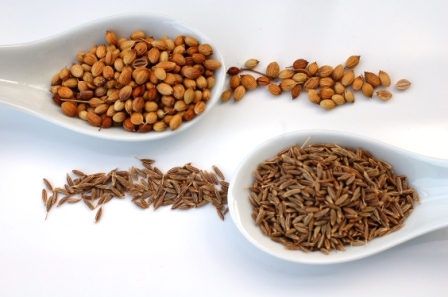 I can’t recall the last time I saw coriander seeds look so good! Loving your site (been here for a while now) and the pictures are fabulous! dangit! I knew there was a possible spin on it that I wasn’t thinking of 🙂 Glad you enjoyed reading it. I have bookmarked your kulfi recipe to try, will post the results when I do! Brilliant! Let me know how it turns out. Oh my god, this is why I’ve been failing at making Indian food all my life, what a revelation! Thanks! Awww glad I could help. Now u gotta try it! Is the oil supposed to seperate from the gravy? How do you accomplish that? I always seem to have a problem. Is it because I’m not supposed to stir the gravy too much? Please help!!! Hi Kat, sorry you are having so much trouble. The spices never dissolve in the oil, they just sort of blend with each other and fry. There should be a little more oil than there are spices so there will be a bit of a puddle of oil around the spices. I hope that helps? If not, please try and give me a more specific idea and I will try to help. Thank so much for your feedback, glad the post was helpful. Feel free to ask any other qns and I will do my best to answer! I know I’m late to the party here but I just had to thank you for this post! I just went through the trouble of preparing and chopping a banana blossom for the first time, just to burn all my spices as soon as I started with the actual cooking. Now I’m way too tired to try this again so the banana blossom gets postponed until tomorrow. I wonder how the type of pan we use affects the tempering. Thoughts? You are welcome! I definitely prefer to use a thick bottomed pan for tempering (and most things) as I find spices burn too quickly otherwise. I hope you had better luck with the second batch! Remember never, ever turn your back on the pan whether tempering or dry toasting!